DON’T BUY WINE WITHOUT IT. Buying wine just got way easier. Never stand in a liquor shop again wondering which of the hundreds or even thousands of wines you’ll take home tonight. We’ve analysed tens of thousands of wines, prices and professional ratings to bring the power of data to that decision. 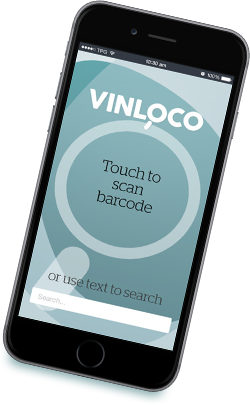 Simply pick up the bottle of wine you’re considering, scan the barcode with Vinloco and we’ll tell you instantly whether that wine is good value or if you should try something else. It’s that easy. All our ratings come from qualified Australian and international wine judges so you can trust our independent assessments. 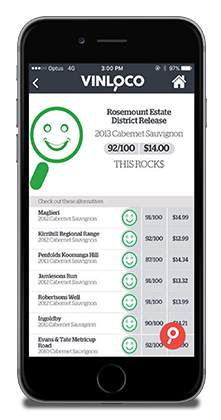 Try the app users tell us changes their wine buying decisions for the better the very first time they use it. Once you do, we don’t think you’ll want to shop for wine ever again without Vinloco. Touch the magnifying glass to scan your bottle’s barcode. Our scanner automatically focuses your phone and captures the bottle’s barcode. Enter the price of the wine you’ve just scanned. Enter the vintage or year of the wine you’ve just scanned. Here’s our simple guide to whether you should buy this wine or consider another. I’m a print publisher – not a wine expert. And neither are most of Australia’s 11.5 million regular wine shoppers. So when I found myself wondering a few years back how to choose between the hundreds of bottles on offer at the local retailer, I realised I probably wasn’t alone. I wanted to create an App drawing on a database that combined all the critical variables of price and quality to help me make a rational shopping decision. In short I wanted to know which wine was the best value. What started out as a simple retail insight is also a great tool for wine buyers and producers. We think Vinloco will not only redefine the way consumer’s think about their next wine purchase but will bring a great deal of power to wine producers as they begin to learn more about the retail landscape. Matthew is founder and CEO of Vinloco. 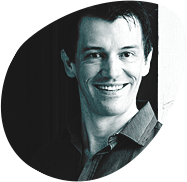 Tyson Stelzer is a multi-award winning wine writer with an annual readership of four million. He was named The Wine Communicators of Australia Australian Wine Communicator of the Year 2013 and The International Champagne Writer of the Year 2011 in The Louis Roederer International Wine Writers’ Awards. Tyson has contributed his independent ratings to Vinloco and will participate in future tasting panels. 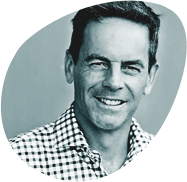 Peter Scudamore‐Smith, is one of Vinloco’s panellists. Based in Brisbane, Peter is one of Australia’s leading wine authorities. He was only the second Australian to earn the prestigious Master of Wine qualification – now one of only 19 in this country – and has judged more than 76 wine shows both here and overseas. Peter has presided at the prestigious International Wine Challenge, the Winestate awards and been a regular member of the Royal Queensland Wine Show panel. Rob Geddes contributes ratings to Vinloco’s database. 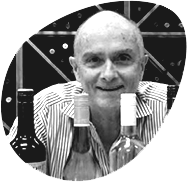 Rob is the author of Australian Wine Vintages, which has been published since 1979, and was the third Australian to pass the rigorous IMW exams and become a Master of Wine. 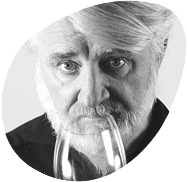 Sydney-based Rob is also an educator, a respected national and international wine judge and a charismatic public speaker.